Work environments are important – they tell visitors a lot about what to expect from the place they are visiting. I almost always enjoy visiting other architects office because it seems like there is always something wacky going on somewhere. I’m not talking about the office’s of large architectural firms – no. I like going into the offices of firms with 30 people or less…15 or less is even better. It’s at the point where budget is still the major obstacle and the possibility of seeing saw-horse desks and reclaimed bookshelves is a distinct and sometimes necessary component. This is the office I work at – as I am writing this, I’m thinking that a picture of the exterior would have made a nice touch….oh well. 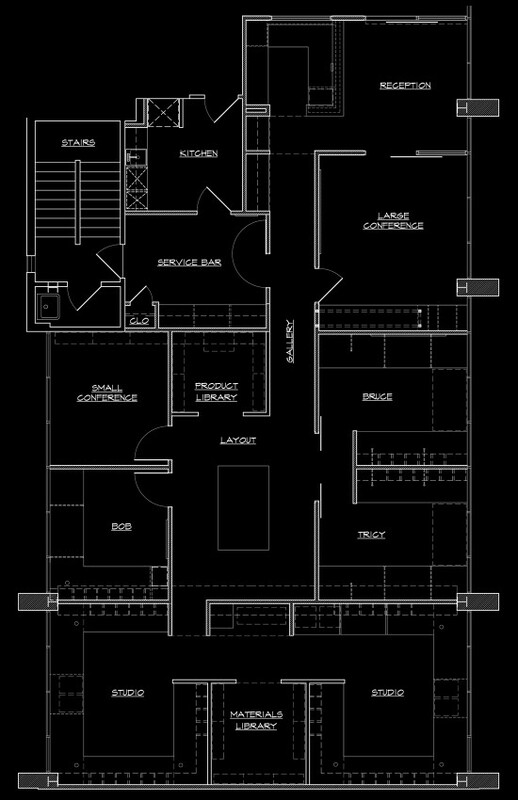 You can look at the floor plan above and see that the layout of our office is really straightforward. Tricy and I laid this office out and we set our programmatic priorities and looking back 4 years later, I think we did a pretty good job. You can probably tell who did most of the work because there is one (that’s right….one) private office in this place and it happens to belong to yours truly. Wanna guess who also has the thermostat in his office? Just one of the perks of being a designer who knows AutoCAD and can do construction administration. I am totally smarter than I look, don’t let my writing style and non-existent grammar skills fool you. Maybe clever is more accurate than smart…. One of the things that we did try and jazz up was our reception desk – but only a little. All the millwork in our office is clear-coated medium density fiberboard (MDF). It is super cheap, incredibly stable and durable and since most people aren’t used to seeing it without a coat of paint on, it seems new and unique. Trickery!! We did however pony up a little extra $$ to insert a MDF decorative panel on the front of the reception desk and as soon as I can remember where we got it, I’ll come back and amend this paragraph (I’m on a deadline here!) I do remember that it cost about $400 for a 4′ x 8′ x 3/4″ sheet. We only have ceilings in just a few places – the conference room and immediately above the reception desk are the only spots with a gypsum board ceiling. We wanted the acoustics to be a little better and have a more finished looking enclosure in the most public of spaces. In the offices we put 2′ x 2′ acoustic tile ceiling in but everywhere else it is open to structure. In the conference room, we have 3″ worth of beam depth popping through the gyp board, but I liked the look and decided to keep the ceiling where it was – just painted it out in the same seal gray as the rest of the deck and structure. Also – see that giant TV, we watch it while eating popcorn as often as not – beer Fridays, The Office and spicy Cheetos, popcorn and cocoa coated almonds. We have a large-ish center area where we put a large layout table. Most of the time, it turns into a temporary dumping ground between meetings but it is an extremely useful area. Not only will we have group meetings and vendor material presentations here, but this table has been used for pumpkin carving contests, gingerbread house making contests, valentine cookie decorating. We even challenged a guy in the office to eat a “Ghost Pepper” (Bhut Jolokia Pepper – the hottest pepper in the world by a long shot). In the end, he only ate the teeniest tiniest bite ever in the history of chickening out at the last minute but he’ll tell you he ate it. He’s a liar. Can you believe it? We actually have flat files? I keep thinking that these dinosaurs will go away but I am coming to the realization that they will never be leaving. Maybe the next generation will figure out how to avoid keeping 15,000 rolls of full size drawings laying about. All I use these days are half size sets – they fit on my desk a whole lot better and I don’t look like a jerk carrying the small rolls around from meeting to meeting. Also, this is our “Resource Library” and it probably is a waste of space. We keep making it smaller and smaller because we get everything off the Internet these days. Far too often, when you rely on the resource library materials, you will select something awesome that they stopped making 13 years ago and you just designed a space around it. (That’s never actually happened to me…I’ve just heard of it happening to others). This is my office – if I had a camera with a wider angle lens you might be able to detect more of what really happens here. There is a low reclining chair just in the bottom left of the photo that is a great napping chair for reading through specifications. You will see that I am rocking the double wide aspect 24″ monitors – how else can I keep up with twitter and blogging and pretending to do my work? Spoiler Alert!! A little possible bad karma might be on my horizon. As I took this photo, the red ribbon on AIA Young Architect of the Year award fell down. That can’t be good right? This is one of the work areas that is in the very back of our office. We put it there because there is typically music being played, some sort of tape-ball tag or rubber band wars. We don’t need to see that sort of thing but we don’t need to pretend it doesn’t happen. I can assure you that there are few people in this country that can shoot you in the eye with a rubber band better than me. I’ve even shot myself in the eye a few times – I’m deadly.